Think back a little bit to when you first started drinking and going to parties. Often times that meant getting together with your friends, trying to round up some alcohol, and heading over to someone’s house (who you may or may not know). Once there you might spread out or you might just hang with the people you came with to the party. Chances are that a lot of those parties you may have attended including drinking games. Beer pong has become an American pastime at parties. Is is really a house party if there isn’t a beer pong table going? But, it seems like every party and every house has its own rules. Some are the same, but others vary. 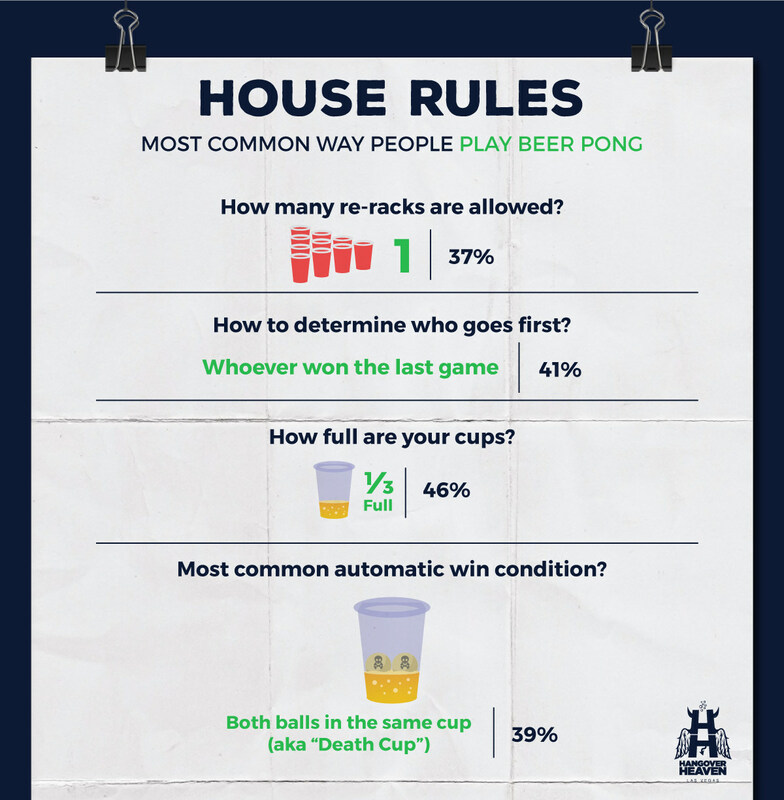 With that in mind, the team at Hangover Heaven decided to conduct a survey that asked about what people’s house rules are when it comes to the popular drinking game. They compiled the results of their survey into some clever graphics that make it feel like you’re right there at the frat party. There are a few house rules when seem to vary the most. Those can be heated topics of debate but here is what they found for some of those. Overall, 37% of respondents say they allow 1 rerack per game. This means that just over a third of players allow a team to reorganize the cups they’re trying to sink the ping pong ball in once per game. This often happens after a couple of cups have been removed from the board. Then, almost half of all players (46%) fill up cups ⅓ of the way. That was one of the highest answers in the entire survey when it came to specific rules. Interestingly, they also uncovered some differences when it came to men vs. women and how they play the game. While both men and women usually use some type of beer (whether craft or macro), women were more likely to use liquor. 18% of women said that is their go-to alcohol for pong. Then, men are 20% more likely to say that beer pong is if their favorite drinking game compared to women. Along with that, men are 63% more likely to play five or more games in a night. People say that one of America’s greatest strengths is the fact that it’s a melting pot of cultures and ideas. Beer pong is a national game that, in a very small way, exemplifies that idea. Most people have played it or have some familiarity with it. But, every party has a slightly different way of playing with slightly different rules. And that’s ok. That’s something that should be celebrated. Enjoy the game and enjoy the different house rules — it’s part of what makes America an amazing place.